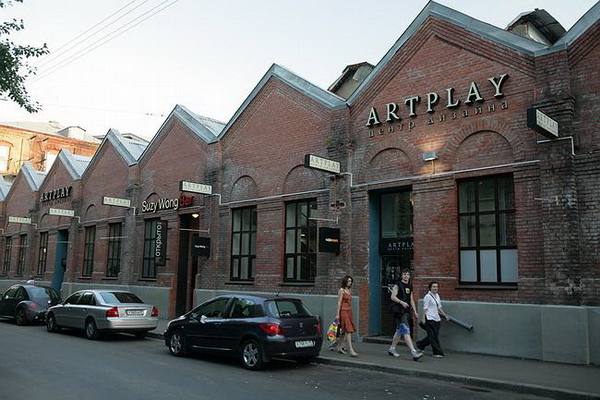 ARTPLAY Design Center is known as one of the first art-clusters in Moscow. Several years ago ARTPLAY moved into an ex-industrial space in the Kurskaya Metro area and now occupies the whole block of 75,000 sq m. Having carefully reconstructed the factory buildings and put new life into them, ARTPLAY turned the complex into an important part of the city cultural landscape. As a specialized business and trade centre in the fields of architecture and design, ARTPLAY unites within its space designers, architects, project-makers, as well as suppliers and retailers of furniture, lighting, ceramics, finishing materials and special equipment, and involves them all into mutually beneficiary cooperation. ARTPLAY Design Center also houses young Moscow galleries, artists’ studios, cafes, bars, bookshops, a music club, a school of design, a cinema, children’s art studio etc. The roof of one of the buildings is a specially equipped area for cultural and leisure activities in the open air, where a swimming pool, tennis tables, a badminton court, a trampoline and sun loungers are installed in the summertime and an ice rink works in winter.